This is a recent mural I painted on the US-Mexico border, commissioned by the Mexican Secretariat of Foreign Affairs (SRE). 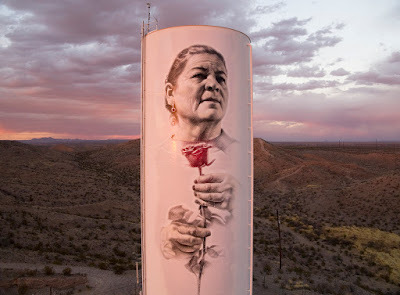 It is on a roughly ten-story high water tank in the remote border community of Presidio, Texas, facing its southern neighbor Ojinaga, Chihuahua. 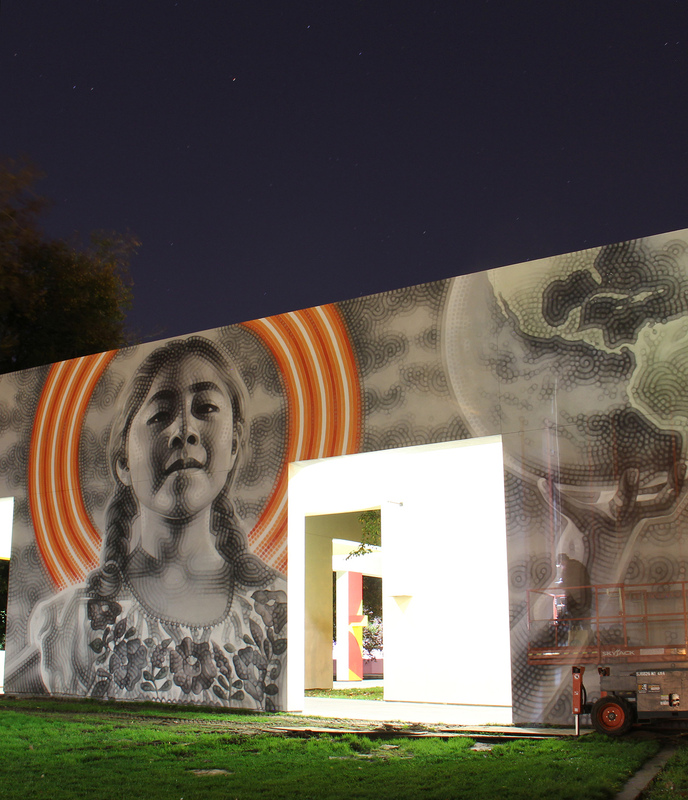 The new mural is a small binational gesture reminding those who reside in the margins that they are not forgotten. 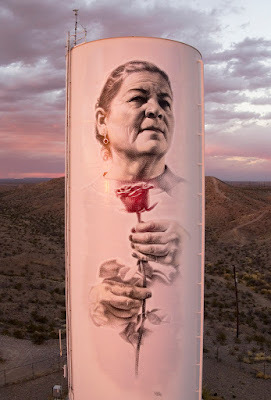 On the northern outskirts of Presidio, a series of modest dirt hills offers a view of the small border town delineated by the meandering Rio Grande. 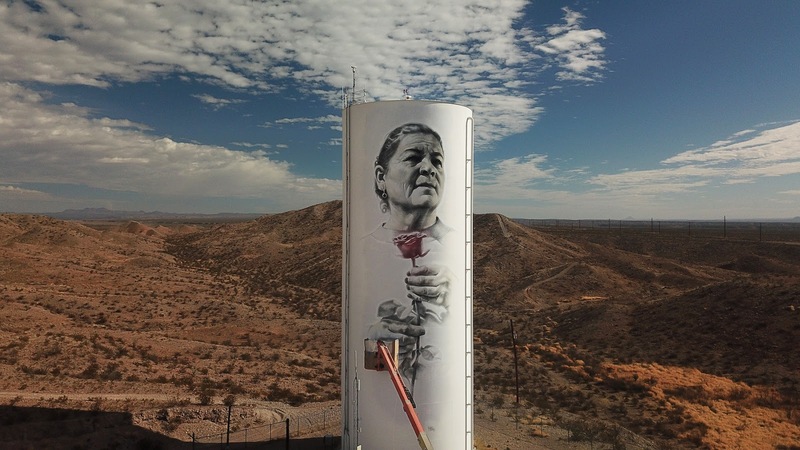 Just beyond, the Mexican sister city of Ojinaga — many times bigger than the Texas town — sprawls along the foothills of the Sierrita de Santa Cruz. 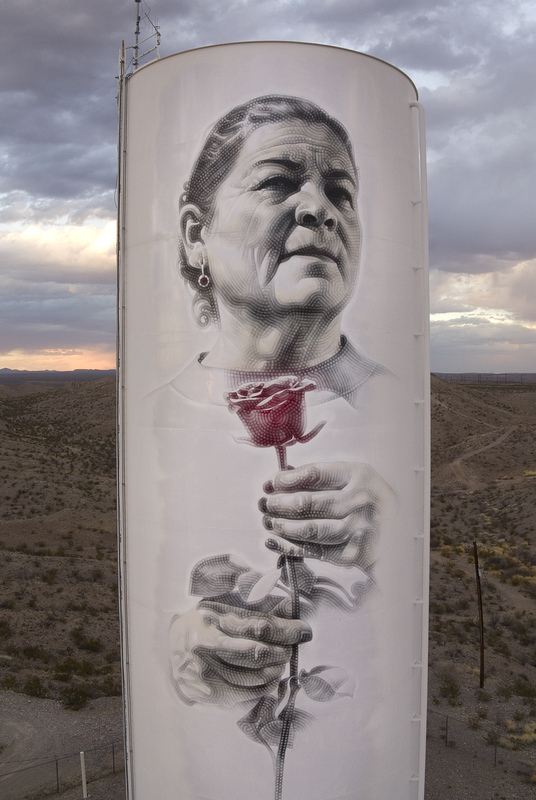 On one side of these crumbling hills is a gridwork of housing for Border Patrol officers, surrounded by chain-link fencing and topped with barbed wire. 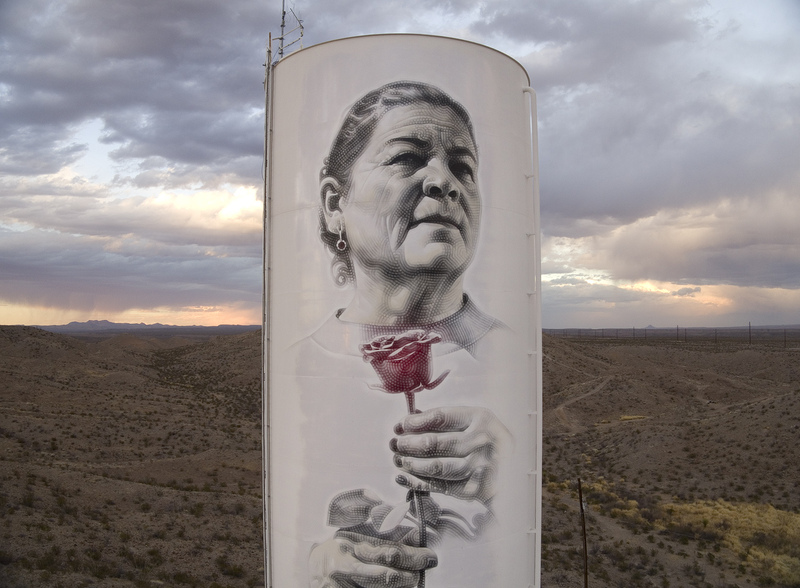 On the other side of the hills is the city’s water tower, a lone white tank that juts above an otherwise unassuming and dusty landscape. 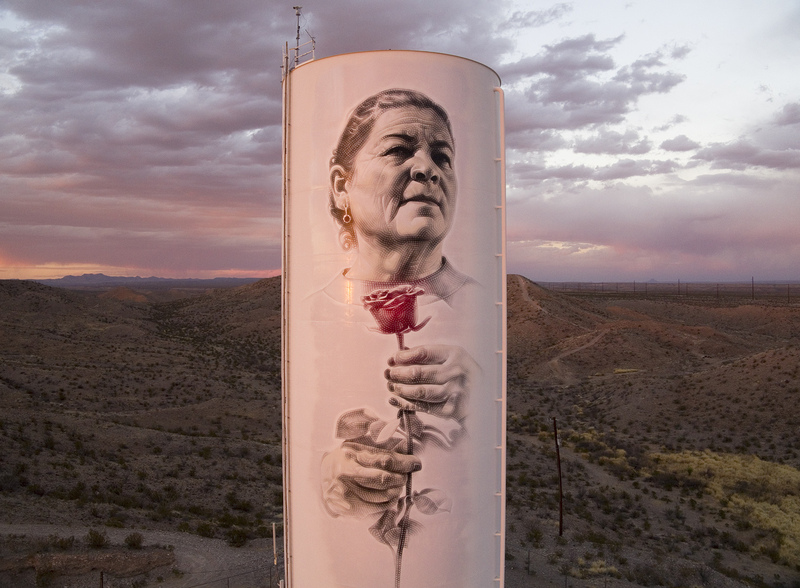 It is the only apparent landmark in a town whose inhabitants have figured out ways to fit their lives discreetly into the rugged desert landscape. 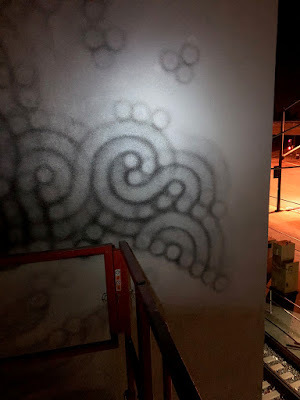 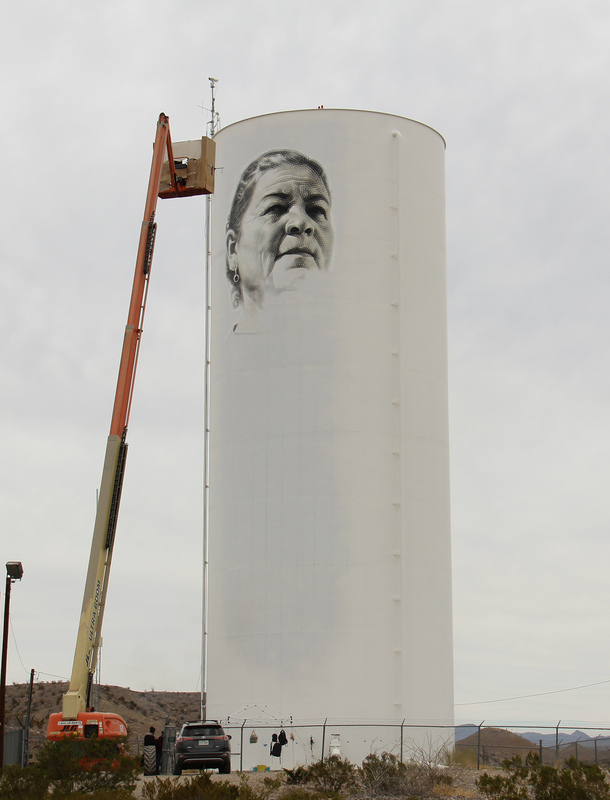 A month ago, a face began to appear on the water tank. She emerged over the course of two weeks: a Latina woman, clutching the stem of a red rose in her thick hands. Her brow and cheeks are lined with age. Her gaze, deep but benevolent, looks out beyond the Rio Grande into Mexico. The mural is a gift from Mexico to the site of its smallest consulate. 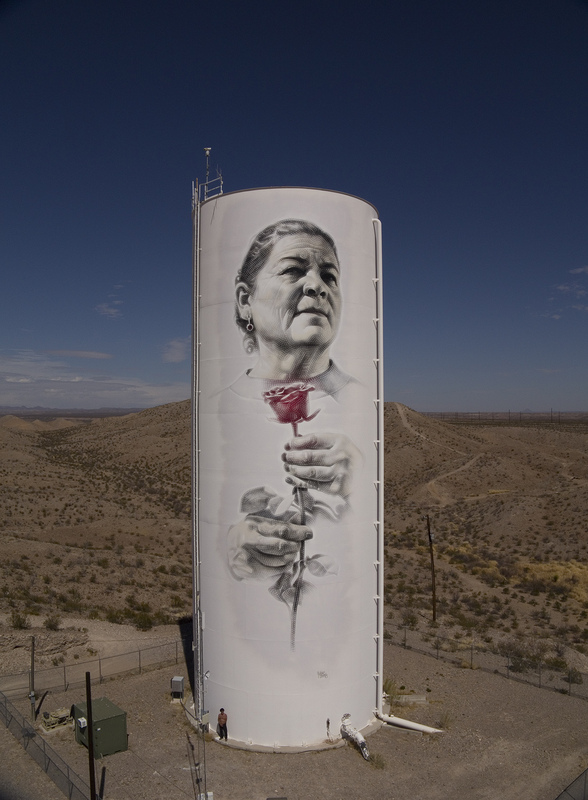 Amid the hyper-politicized rhetoric that surrounds the border, it was a small binational gesture reminding those who reside in the margins that they are not forgotten. 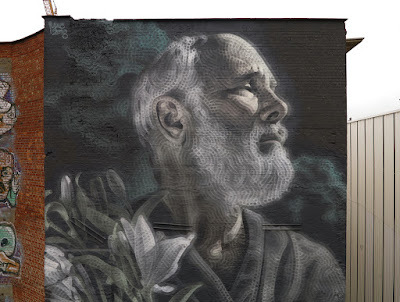 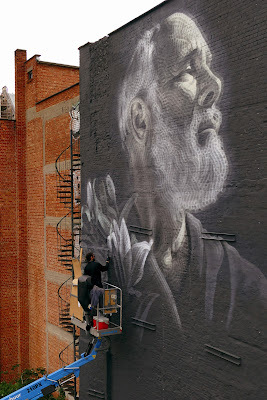 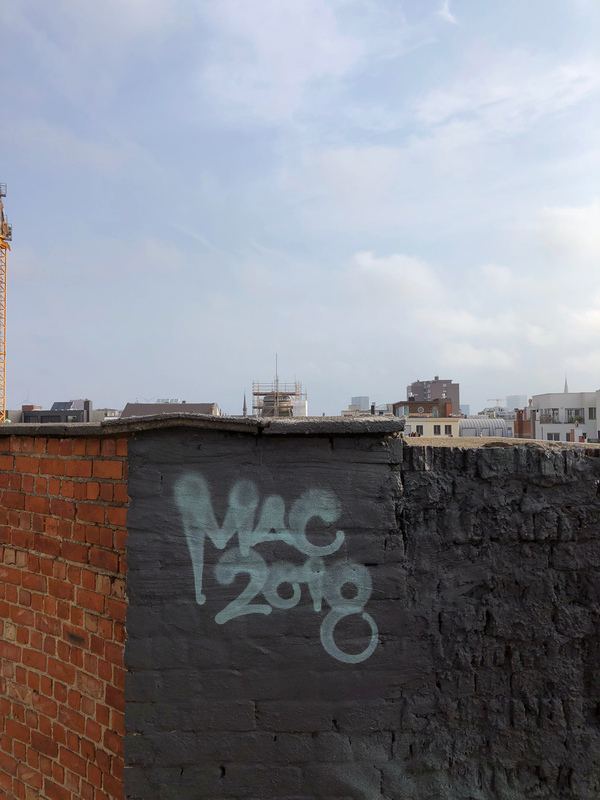 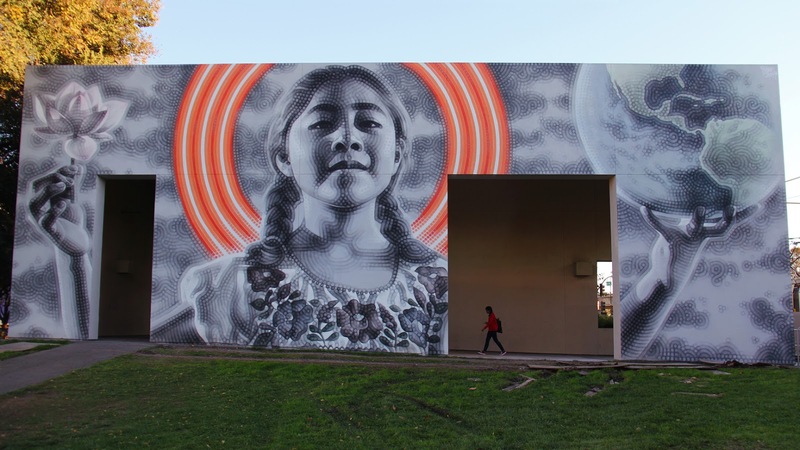 The Mexican government commissioned Los Angeles muralist Miles Mac, known as “El Mac,” whose work has appeared in the border cities of Juárez and El Paso, as well as myriad other places across the globe, from New York City to Agdz, Morocco. 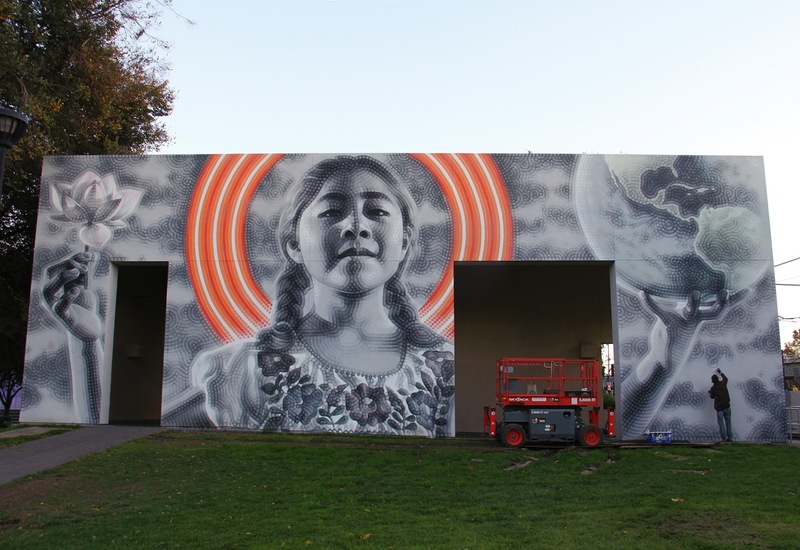 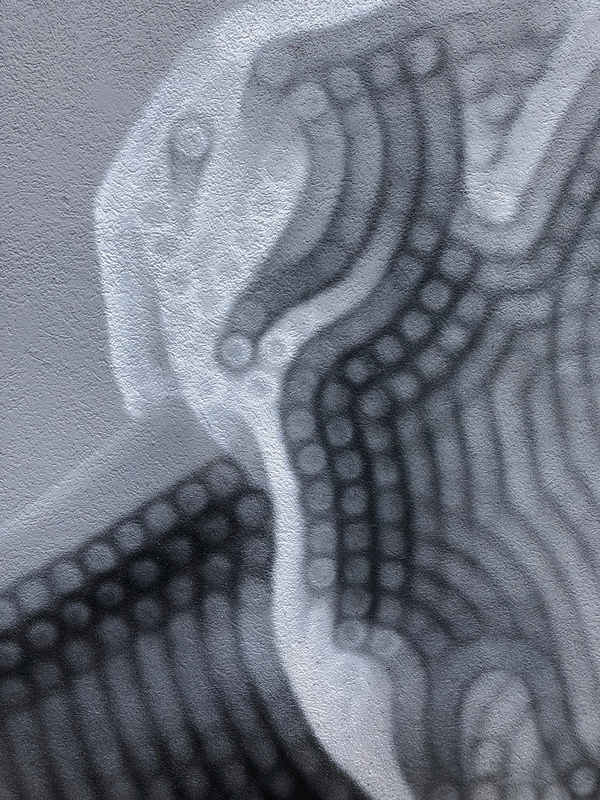 El Mac would experience the kind of kindness Lujan seemed to represent throughout his stay in Presidio. On days he spent painting for 10 or 12 hours at a time, perched some 100 feet off the ground in a mechanical lift that quaked against the howling spring winds, staff from Don Jose Panaderia, the local bakery, delivered pumpkin empanadas in a basket rigged with a pulley system. 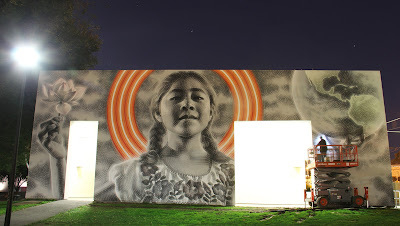 “That mural was fueled by those pumpkin empanadas,” he said. 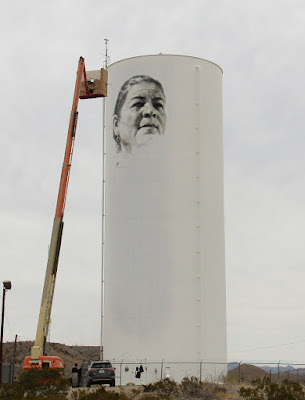 The face on the water tank is visible from both sides of the border, a reminder of what many in the town already know to be self-evident: that Presidio is inextricably tied to its Mexican neighbor, and that its well-being is rooted in their mutual goodwill." 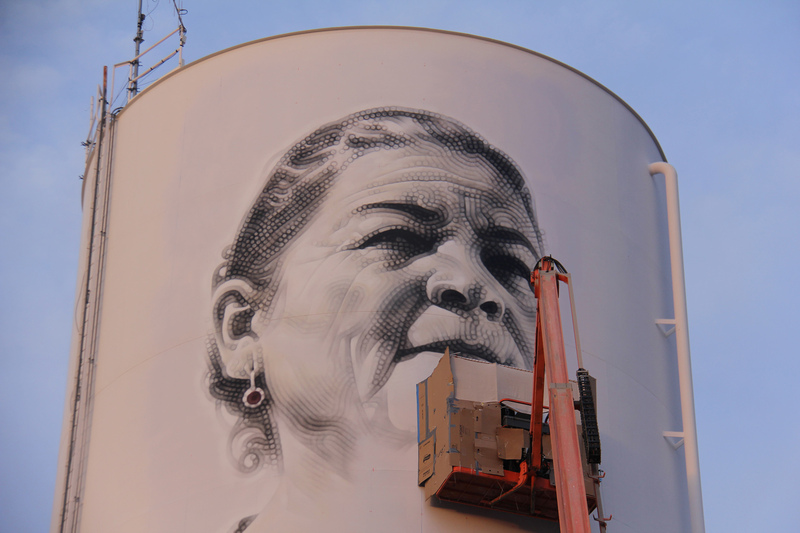 Many thanks to the Mexican Secretariat of Foreign Affairs (SRE) and Mónica Cortina Mariscal for making this project happen, and many additional thanks to Guido Mascherpa, Eduardo Romero, and Eric Heights for all the assistance and good times. 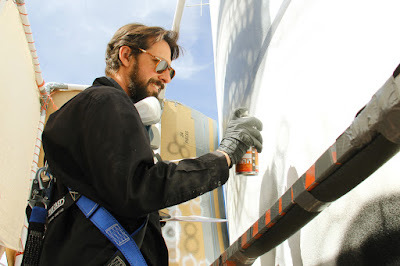 They helped rig a protective structure for the lift basket out of cardboard, duct tape, pvc pipes and canvas--a small Mexi/Italo/Salvi/US engineering project that was crucial in helping to block the constant strong winds there and ultimately made the painting possible (it also included a pulley system that allowed burritos and empanadas to be hoisted up to me during my long, sometimes 14-hour painting shifts). 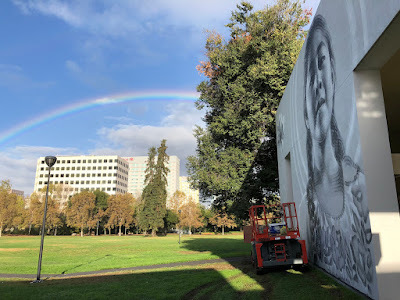 Extra thanks and shout-outs to the Mexican consulate in Presidio, Mariana Da Silva, Austin Saya & their team, Don Jose Panaderia, the Bean Cafe, Oasis Restaurant, Three Palms Inn, Enrique Madrid & the family of Esequiel Hernandez Jr., Brad Newton, Terry Bishop, John Ferguson, Trisha Runyan, Linda Luján, and to everyone else in Presidio who showed support or kindness. 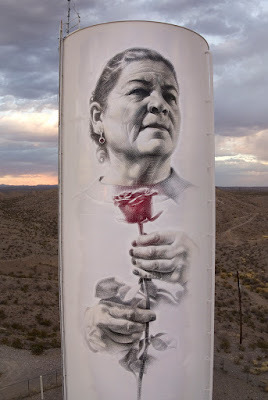 Presidio/Ojinaga, in all its remoteness and smallness, felt important, familiar and alive--I'm grateful for my experience there, and the opportunity to share my art with its people. 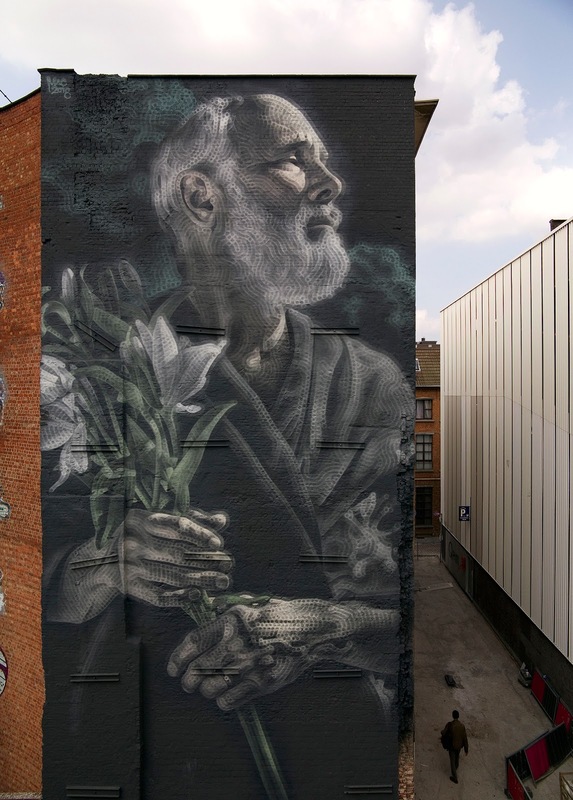 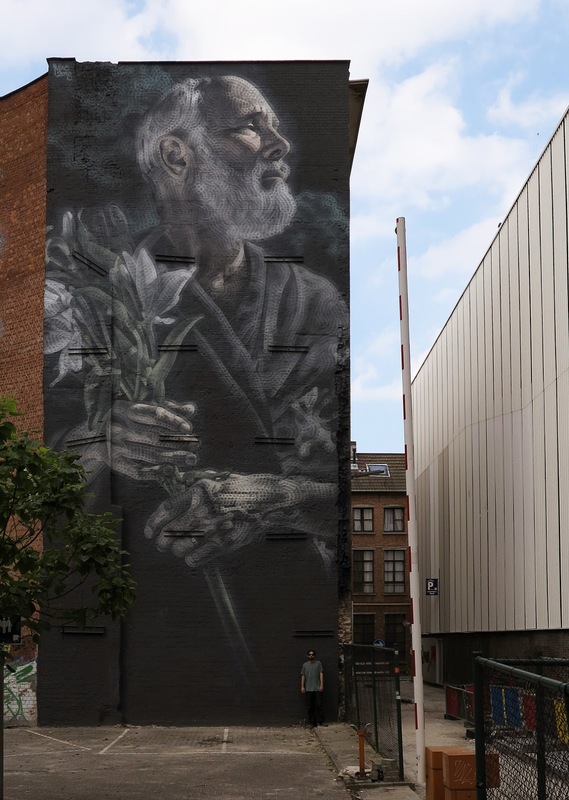 'Mural for My Father' is the title of my most recent mural in Europe, commissioned by the City of Antwerp for Antwerpen Barok 2018, and the Baroque Murals project curated by Yvon Tordoir, part of Antwerp’s yearlong celebration of Baroque art and culture. 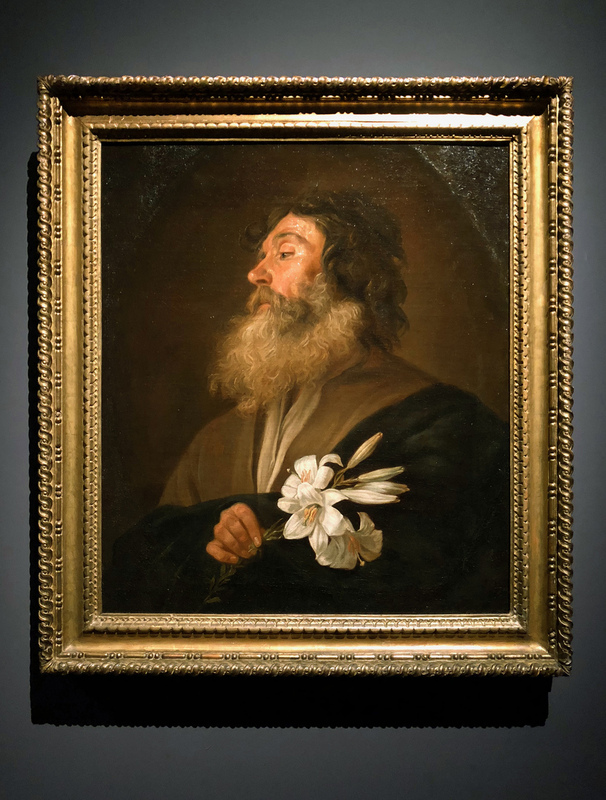 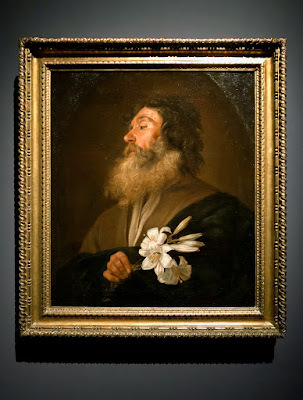 This piece is an interpretation of a depiction of Saint Joseph from the mid-1600s by Flemish painter Michaelina Wautier (this painting is currently on display in an exhibition of her work at the MAS museum in Antwerp). 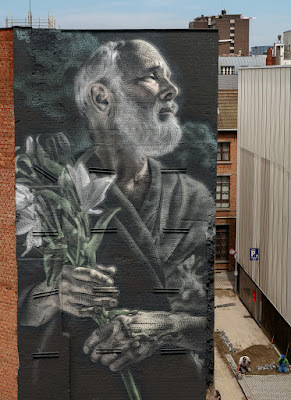 Belgium is a special piece for me for a number of reasons. 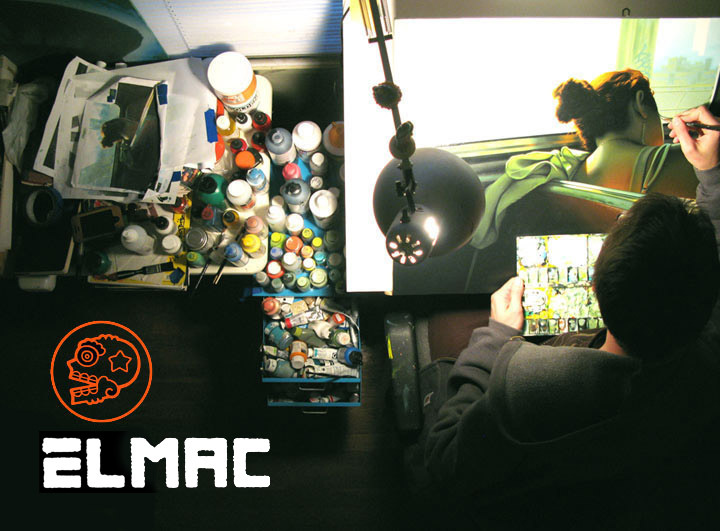 The first time I came to Belgium was in 2003 to participate in a group show titled Young Primitives with the nearby Groeningemuseum in Brugge, where a handful of other aerosol/graffiti artists and myself painted pieces around the old city that were inspired by the museum’s collection of work by Flemish Primitive painters. This was a hugely impactful project for me and made me fall in love with Belgium, so I was excited to return to Flanders for another project with a similar theme. This is also a continuation of my finding inspiration in the work of often underrepresented women painters of the past—including my ‘Phoenix Goddess’ mural painted in 2004 in downtown Phoenix, which was inspired by an 1826 painting by Belgian artist Elisa de Gamond. 'Mural for My Father' is located in the heart of Antwerp, between the Rubens Museum and the 14th-century Cathedral of Our Lady, and this area is filled with small statues of religious figures (mostly Madonnas) affixed to buildings overlooking street corners. I was inspired and impressed by these, seeing them not only as a beautiful form of public art but indicative of an exuberant cultural embrace of a Mother archetype--seemingly everywhere you go in Old Antwerp you are watched over by symbols of maternal benevolence. 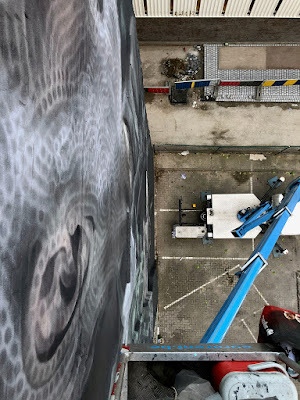 This project was made possible thanks to Stad Antwerpen, Antwerpen Kunstenstad, Yvon 'Rise' Tordoir + Aerosol Kings, Lieselotte De Beer, and Dré Demet. 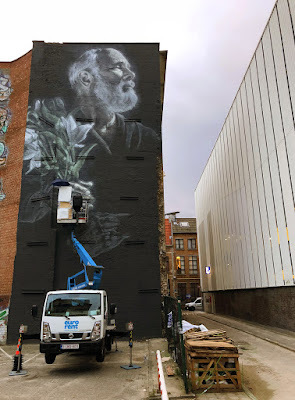 Additional thanks to the many kind people of Antwerp who showed support and appreciation, including the mystery donor who left that impressive bag of snacks for me! 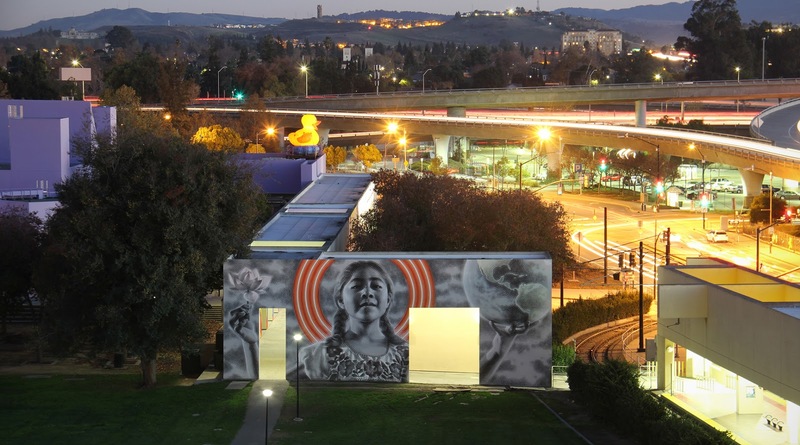 Mural commissioned by the San Jose Museum of Art, in collaboration with The Propeller Group. In these times when fear, inequity and divisiveness are so prevalent, this mural is intended to convey hope and empathy. 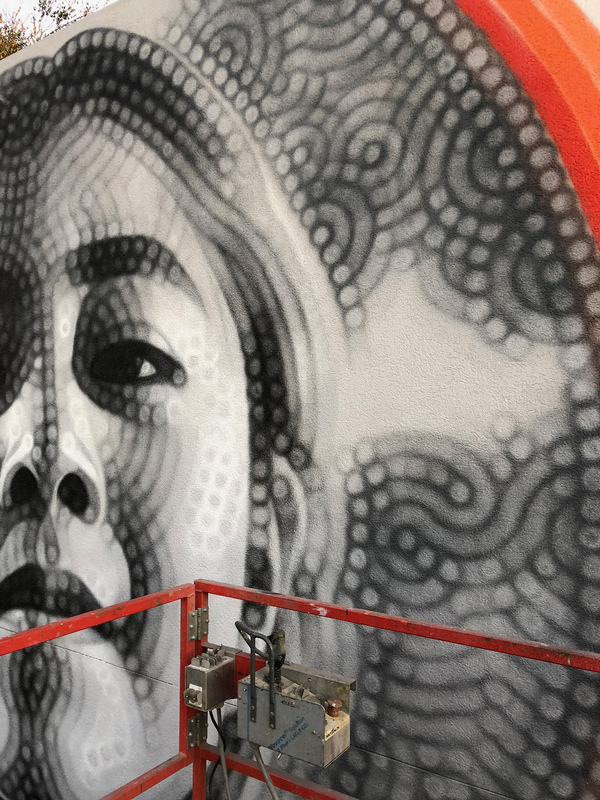 The figure is based on an inspiring young activist named Sophie Cruz, who represents mixed-status families and advocates for immigration reform in the US. When I met Sophie to shoot reference photos of her I asked if there was anything she wanted to hold for the photographs, and she came back holding a globe. 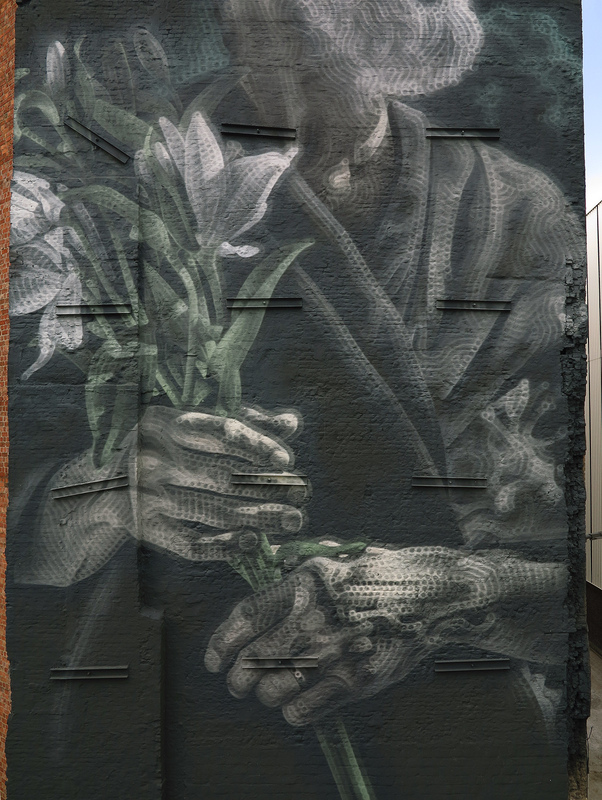 This seemed perfect, while the lotus was added to symbolize the beauty that can grow from humble origins. .
I’d like to thank everyone who helped make this mural happen, and everyone who came by offering positive feedback. The response from the people in San Jose was some of the most encouraging and supportive I’ve received anywhere, I’m very grateful. Many thanks to Tuan Andrew Nguyen, Matt Lucero, The Propeller Group, Lauren Dickens and the San José Museum of Art, Empire Seven Studios, Will Moran, the Children’s Discovery Museum, The Knight Foundation, University Art, Tad Freese and Brook Hartzell, Beverly and Peter Lipman, Lubliner, Dipti and Rakesh Mathur, Ian Reinhard, and SGSR. 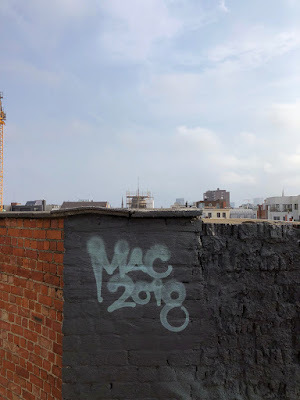 Additional thanks to Sophie + su familia, Eric Heights, Yosi Sergant, Define American, Yosimar Reyes, Bích Cao, and everyone else who helped or showed love. 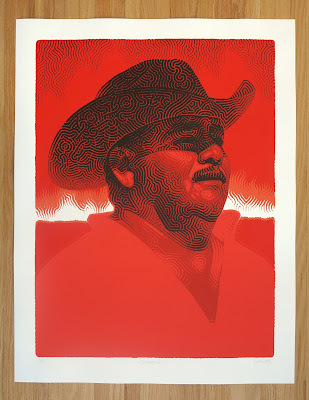 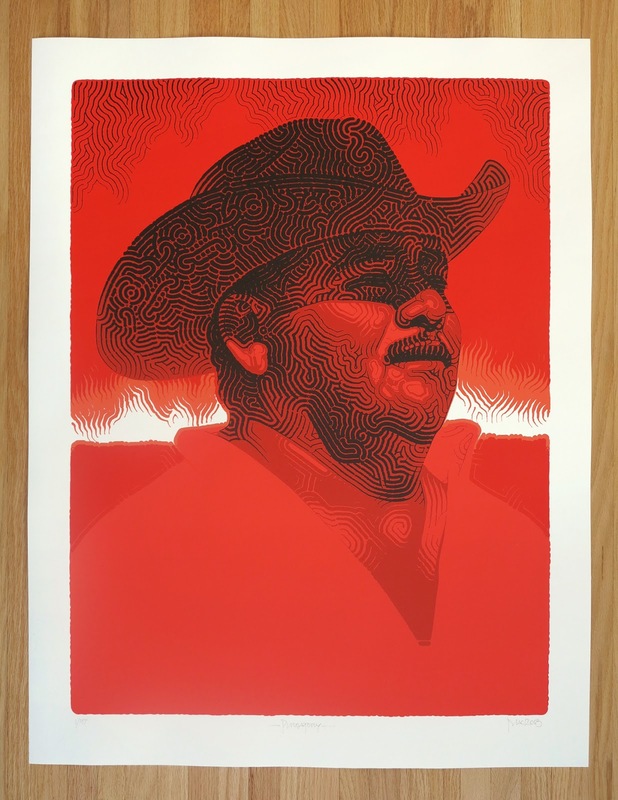 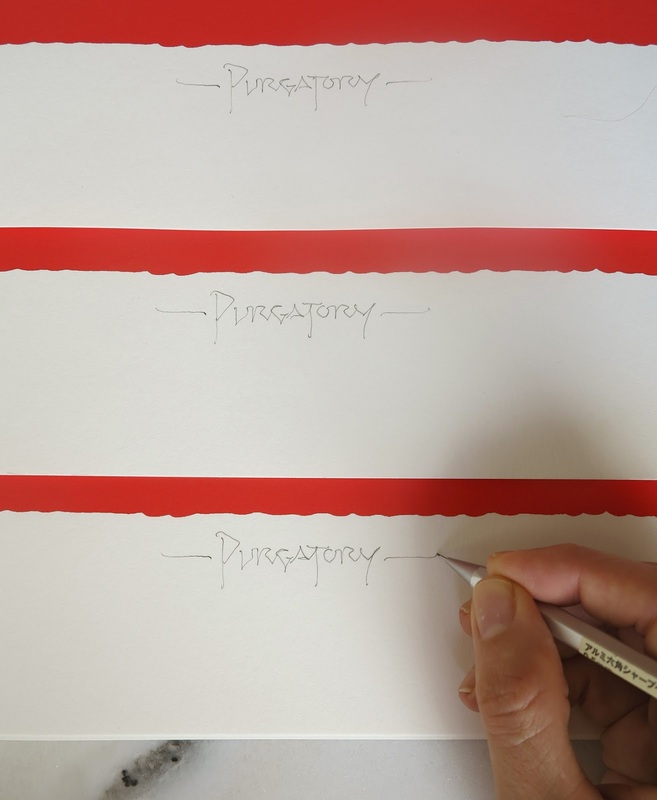 New EL MAC prints: "Purgatory"
Signed, titled, and numbered by the artist. 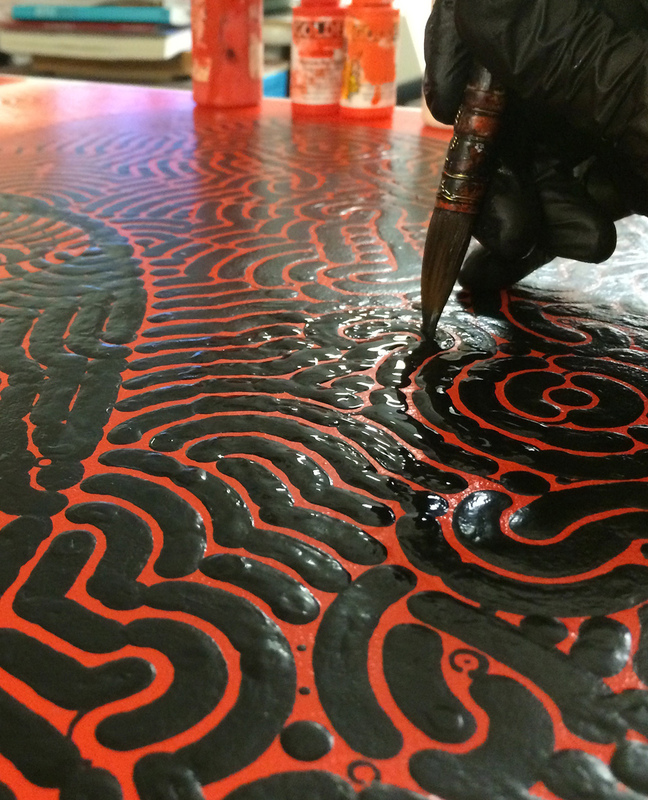 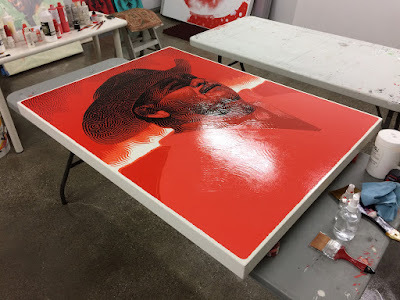 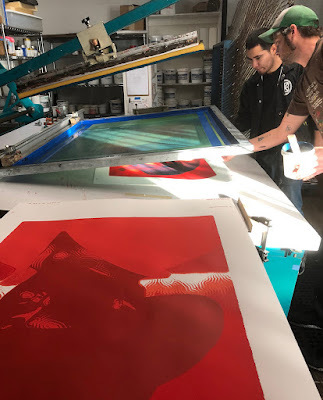 Hand-pulled serigraph by master printer Tony Clough at Serio Press in Pasadena, California. Printed in five colors/layers. 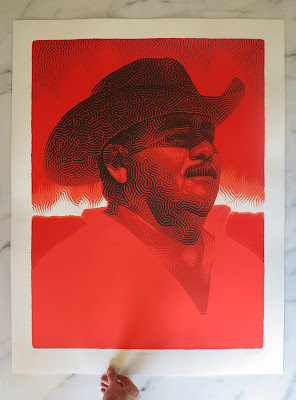 Printed on acid-free, 100% cotton, 290 gsm, Coventry Rag paper. This print has the same exact dimensions as the 'Los Campesinos' prints from 2015. 'Across ancient cultures from around the world there are concepts of a period of postmortem atonement, with associated traditions of prayers and offerings made for the souls of the deceased so as to relieve their expiatory suffering. This artwork is also, in its own way, a similar kind of prayer or offering. In these times of fear, confusion, nativism, and worsening inequity as more and more wealth is distributed from the many to a few, I painted this piece partly as a meditative gesture of support for the marginalized and scapegoated amongst us who live and work in a metaphorical state of purgatory.